Who, really, is behind the epidemic of global terrorism against civilians? Whom should airport security personnel view carefullyâ€”respectfullyâ€”but very, very carefully? Oh the irony! 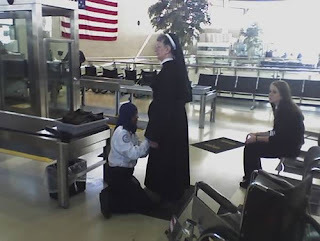 A hijabbed muslimah is frisking a nun…..
ON A WARM, cloudy day in the fall of 1999, the town of Daphne, Ala., stirred to life. The high-school band came pounding down Main Street, past the post office and the library and Christ the King Church. Trumpeters in gold-tasseled coats tipped their horns to the sky, heralding the arrival of teenage demigods. The star quarterback and his teammates came first in the parade, followed by the homecoming queen and her court. Behind them, on a float bearing leaders of the student government, a giddy mop-haired kid tossed candy to the crowd. Left, Omar Hammami as a freshman in high school. Right, in a Shabab propaganda video released in March 2009. Omar Hammami had every right to flash his magnetic smile. He had just been elected president of his sophomore class. He was dating a luminous blonde, one of the most sought-after girls in school. He was a star in the gifted-student program, with visions of becoming a surgeon. For a 15-year-old, he had remarkable charisma. * The Guardian: “Government efforts to prevent the radicalisation of British Muslims have been set back by Israel’s assault onÂ Gaza”,Â Â the security and counter-terrorism minister, Lord West of Spithead, announced yesterday.